Polarized lenses have special glare-reducing features that reduce glare from hard surfaces, bright lights, water, and snow. While tinted lenses are great for reducing brightness, they don’t eliminate glare. 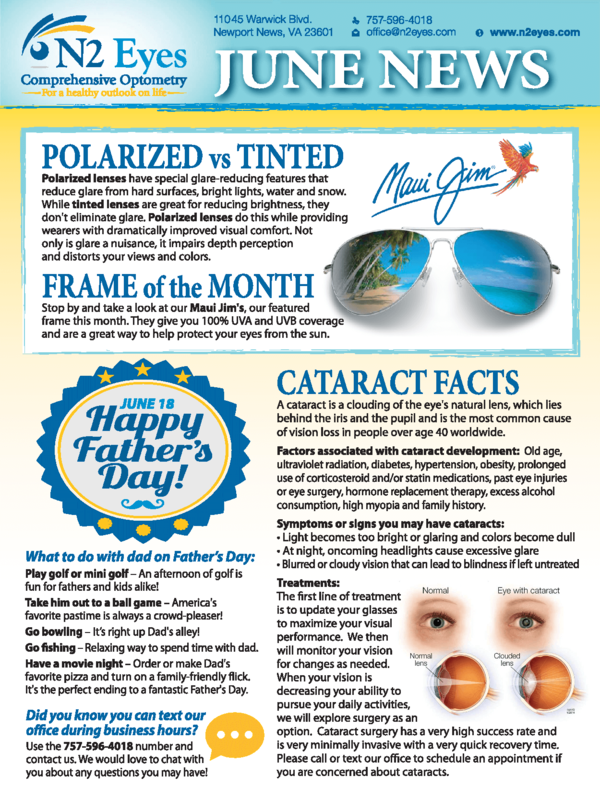 Polarized lenses do this while providing wearers with dramatically improved visual comfort. Not only is glare a nuisance, it impairs depth perception and distorts your views and colors. Stop by and take a look ar our Maui Jim’s. our featured frames this month. They give you 100% UVA and UVB coverage and are a great way to help protect your eyes from the sun. Play golf or mini golf-An afternoon of golf is fun for fathers and kids alike! Take him out to a ball game- America’s favorite pastime is always a crow-pleaser! Go bowling-Its right up Dad’s alley! Go Fishing-Relaxing way to spend time with dad. Have a movie night-Order or make Dad’s favorite pizza and turn on a family friendly flick. It’s the perfect ending to a fantastic Father’s Day. Did you know that you can text our office during business hours? Use the 757-596-4018 number and contact us. We would love to chat with you about any questions you may have! A cataract is a clouding of the eye’s natural lens, which lies behind the iris and the pupil and is the most common cause of vision loss in people over age 40 worldwide. Factors associated with cataract development: Old age, ultraviolet radiation, diabetes, hypertension, obesity, prolonged use of corticosteroid and/or statin medications, past eye injuries or eye surgery, hormone replacement therapy, excess alcohol consumption, high myopia and family history. Light becomes too bright or glaring and colors become dull. At night, oncoming headlights cause excessive glare. Blurred or cloudy vision that can lead to blindness if left untreated. The first line of treatment is to update your glasses to maximize your visual performance. We then will monitor your vision for changes as need. When your vision is decreasing you ability to pursue your daily activities, we will explore surgery as an option. Cataract surgery has a very high success rate and is very minimally invasive with a very quick recovery time. Please call or text our office to schedule an appointment if you are concerned about cataracts. View the print version of our newsletter.